Closing Arguments End in Corruption Trial of Ex-Va. Gov. 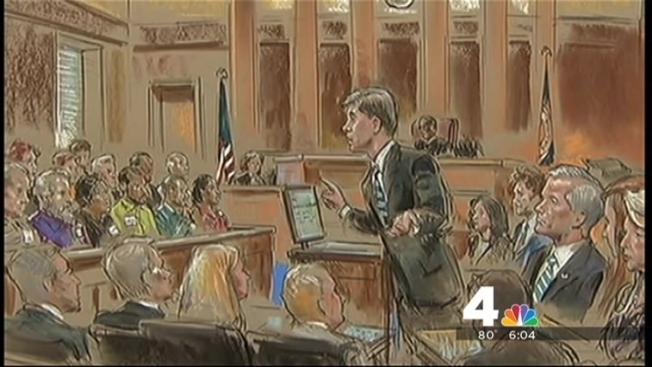 Closing arguments and rebuttal in the corruption trial of former Virginia Gov. Bob McDonnell and his wife, Maureen, ended Friday, and the jury will get the case Tuesday. The former first couple is accused of accepting gifts and loans from businessman Jonnie Williams in exchange for using the governor's office to promote Williams' dietary supplement company, Star Scientific Inc.
Bob McDonnell's defense accused the prosecution of tearing the former governor's life apart without proof he did anything other than arrange a standard meeting for Williams, saying, "The federal government has not produced any evidence, least of all that Bob McDonnell committed bribery or defrauded a bank." McDonnell's defense slammed Williams, saying he invented the corruption story to get federal immunity. The prosecution started its closing arguments going right after Bob McDonnell, mockingly referring to him as "Mr. Transparency" and "Mr. Honesty," as the defense has tried to portray him. In more than two hours of remarks, prosecutor David Harbach told jurors, "This is fundamentally a simple case.... The single, simple question is, why? Why did [Jonnie Williams] give [the gifts and loans]? Why did [Bob McDonnell] take them?" “That is bribery. That is corruption ... the real thing,” he said. Jurors heard 24 days of testimony and evidence, so the prosecution gave them the abridged version and simplified the timeline, using a slideshow on monitors to reference some of the evidence. The prosecution displayed photos of the former governor wearing a Rolex purchased by Williams, asking jurors, "Who poses for seven photos with a watch you think is fake?" Harbach said of McDonnell, "He knew the deal with Jonnie Williams was dirty." The prosecution pointed to the governor's mansion event that served to promote Star Scientific. Having the governor show up at that event is what mattered to Williams, the prosecution said. "This was exactly what he wanted,” Harbach said. “This was exactly what he was paying for." McDonnell earlier calmly and confidently testified in his own defense, saying the couple did nothing illegal and extended courtesies to Williams like any other elected official would. Prosecutors said a product launch event at the governor's mansion was outside the norm of usual courtesies. Harbach said the only reason Williams did not get the state-backed scientific studies of Anatabloc that he wanted was because a McDonnell aide “shut it down.” While state officials rejected Williams' requests, McDonnell never did, Harbach said. “That's because he was on the Jonnie Williams gravy train, and he and Jonnie Williams had a deal: Do what you can when opportunities arise and I'll keep paying,” Harbach said. Harbach challenged the former governor's credibility, questioning McDonnell's assertion that he knew nothing about an April 2011 shopping spree in New York City in which Williams spent nearly $20,000 on designer dresses and accessories for Maureen McDonnell to wear at her daughter's wedding. The former governor wasn't on the shopping spree but did sit next to Williams later that day at an event. After lunch, Maureen McDonnell's lawyer emphasized that she was not a public officials. "Even if [Maureen] did agree to promote [Williams'] company in exchange for loans and gifts, she would be guilty of no crime.... That is because Maureen was a volunteer, nothing more." Then the defense attacked Williams’ testimony, telling the jurors, “A case built on the word of Jonnie Williams is the very definition of reasonable doubt." The five-week trial has featured the testimony of the former governor and Williams, the prosecution's star witness. Maureen McDonnell did not testify. The McDonnells are charged with accepting more than $165,000 in gifts, trips and loans from Williams in exchange for promoting his company's supposed cure-all, the tobacco-derived anti-inflammatory Anatabloc. Defense attorneys have suggested the couple's marriage was so fractured that they couldn't have conspired with each other to get the gifts and loans. Maureen McDonnell's attorney said the first lady developed a "crush" on Williams, but Williams testified under immunity that he spent lavishly on the McDonnells only to secure their help. Bob McDonnell said Williams never really asked for anything and didn't get anything other than routine political courtesies. During his closing argument, the prosecutor disputed that claim, telling jurors, "Bob McDonnell knew exactly why Jonnie Williams was showering his family with gifts, and so do you." "This is fundamentally a simple case... [the] single, simple question is, why?" the prosecutor asked. "Why did [Jonnie Williams] give [the gifts]; why did [Bob McDonnell] take them?" He said that evidence shows the McDonnells were "hurting financially." On Thursday, FBI agent Kathryn Weber testified Thursday that Bob McDonnell and his wife spent many nights together in the governor's mansion, a final effort to undercut the defense argument that the couple's failing marriage made a conspiracy implausible. McDonnell has said that he and his wife now are living apart. Weber, the last witness for the prosecution, analyzed the McDonnells' cellphone records and 3,000 calendar pages, concluding that the couple spent 89 percent of their nights together during the 22 months that were the focus of the investigation. Most of the nights together were in the governor's mansion, Weber testified, but some were on trips. Bob McDonnell's attorney, John Brownlee, challenged Weber's methodology and conclusions, rattling off 20 occasions when McDonnell did not arrive at the governor's mansion until 11 p.m. or later, implying that the couple couldn't have had much time together on those nights. Brownlee also pointed to several blank daily calendars for Maureen McDonnell, which the FBI agent counted as nights at the mansion. Weber said she was not aware that Maureen McDonnell sometimes spent the night at the couple's private home in suburban Richmond. Prosecutor Jessica Aber suggested that the few instances raised by Brownlee did not substantially alter the overall picture of how often the McDonnells were together. The former governor spent more than four days on the witness stand proclaiming his innocence and describing how his marriage deteriorated as he climbed the political ladder. He testified that communication between him and his wife was perfunctory at best, and he avoided his wife to escape her anger.